Just to have a passport photo, you have to fold the white background. 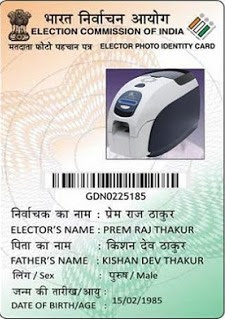 Voter ID card will come to know how to color. First on the Election Commission website will kick www.nvsp.in. Must click on New Registration. There will have to give his email ID and phone number. Just from the beginning of the current information to create your ID card. Here you have all the information you will be asked a number of upharanta. Here you will need to upload a color photo. Votaraaidi noted that an important document. Fill to do it very faithfully all information provided and no mistake. Usually be aware that not missed any error. You can not only Czech but also your voter card application status online. Which is the verification of passports. In the same way all the online information in Czech to booth level officer will be checking your home. It will check the documents that you've uploaded. Then within a month you will be delivered at the Indian voter ID card through the post. Voter ID card, you'll have to upload the document to address different types of proof and ID proof. Your passport for her, the tenth sheets, birth certificates, PAN card, driving license, Aadhar card, bank passbook, phone bills, water bills, electricity bills, gas bills, etc.